Dial Archive | Dial | We Stand for Tv Campaign for Greater Fort Wayne Inc Wins Telly Award | One Lucky Guitar, Inc.
Fort Wayne, Ind. 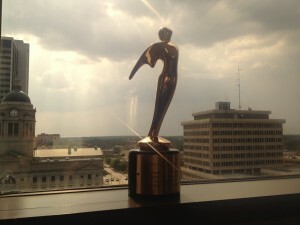 – Greater Fort Wayne Inc.’s “We Stand For” TV campaign has been named a Bronze winner in the 35th Annual Telly Awards. With nearly 12,000 entries from all 50 states and numerous countries, this is truly an honor in marketing excellence for the greater Fort Wayne community. The “We Stand For” marketing campaign was created by Greater Fort Wayne Inc. and One Lucky Guitar. The purpose of the “We Stand For” campaign was to generate brand awareness for Greater Fort Wayne Inc. The four month long campaign included TV and radio spots, billboards, print ads, gobo lights on local businesses, and social media outreach. Along with One Lucky Guitar, BFA Commercial Photography was instrumental in setting the style for the campaign’s videography and photography. To view the “We Stand For” TV spots, visit: We Stand for a Greater Community and We Stand for a Greater Future. To find out more about the Telly Awards, visit: www.tellyawards.com. About Greater Fort Wayne Inc. Greater Fort Wayne Inc. is the new organization that unifies the Fort Wayne‐Allen County Economic Development Alliance, the Greater Fort Wayne Chamber of Commerce, and Leadership Fort Wayne, serving as a single point of contact for economic growth in Greater Fort Wayne. In addition, the Downtown Improvement District is also working toward an affiliation with Greater Fort Wayne Inc. Together, we’re growing a more prosperous, vibrant community in Greater Fort Wayne. To learn more about Greater Fort Wayne Inc., visit www.GreaterFortWayneInc.com. About One Lucky Guitar, Inc.
One Lucky Guitar, a Fort Wayne-based design & marketing boutique, was founded in November, 2000 and specializes in high-concept design, advertising and marketing, providing clients with top-shelf creative work and full service through strategic partnerships. Advertising clients include Ambassador Enterprises, Arts United, AWS/Benchmark, Carson Boxberger, Grand Wayne Center, Greater Fort Wayne Inc., Human Motor Works, J K O’Donnell’s, Matilda Jane Clothing Company and Turnstone. With Indianapolis’ Lodge Design, OLG is the agency of record for the Lutheran Health Network. **This press release was distributed by Greater Fort Wayne Inc. on August 4th, 2014. PREV | Three types of hot. © 2019 One Lucky Guitar, Inc.